Immerse yourself in a sampling of local adventure when you visit our one-of-a-kind visitor center where you can kick a hole-in-one on our Kickmaster Footgolf putting green, charge your phone while you pedal our bike from nearby neighbor, Heritage Cycles, explore our local culture via an expansive local art gallery, and relax in our “living room” as you discover all there is to see and do in our area. 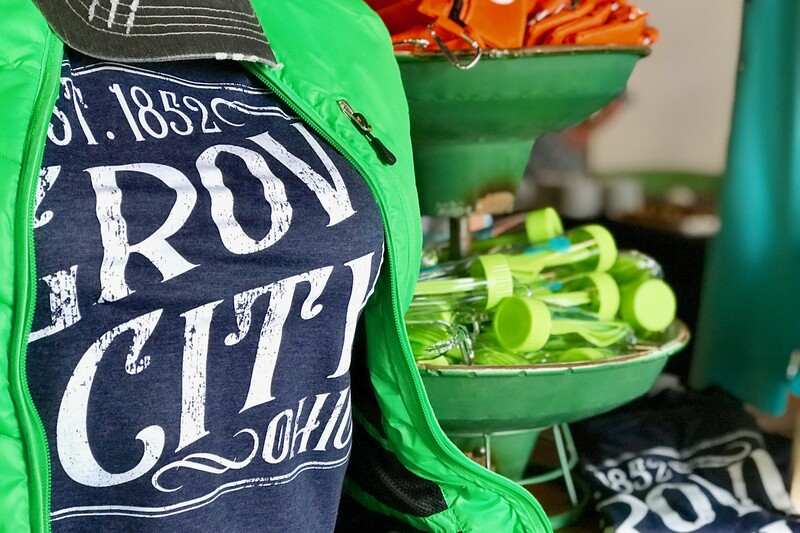 Find the perfect complement to your next Altogether Adventure™ in our unique local shop, Grove City Guide + Gear. Whether you need a hammock to lounge in during a hike at Scioto Grove Metro Park, a dry bag to keep your phone safe during a paddle at Trapper John’s Canoe Livery, or a picnic backpack, complete with a built-in cooler and place settings for two, which pairs perfectly with a trip to one of over 20 Grove City area parks, we’ve got the gear to ensure your Grove City adventure is complete. We don’t stop there, Grove City Guide + Gear highlights the doers, makers, crafters and storytellers who make Grove City special. Live like a local and feed your curious mind with a selection of books from area authors and illustrators. Taste local flavors via artfully created candies from the masters at Le Chocoholique, carefully produced trail mixes from Tropical Nut & Fruit and a variety of honeys from Grove City’s Hinton Apiaries. Don’t miss ample bounties from our earth with a variety of goods from Circle S Farms. Find the perfect gift with handmade jewelry, seasonal greeting cards, handcrafted ceramics and more. We look forward to welcoming you to our Grove City Visitors Center. You can also contact our helpful staff by calling 800.539.0405 or 614.539.8747 or by emailing answers@visitgrovecityoh.com. For 24-hour access to visitors guides and other local maps and brochures, stop by the Grove City Welcome Center and Museum. During business hours, museum hosts offer a wealth of information regarding Grove City’s pioneer roots, horse and greyhound racing history, plus rotating exhibits highlighting everything from vintage toys, baseball history, wood carvings, fossils and more! Check their website to see the latest exhibits.